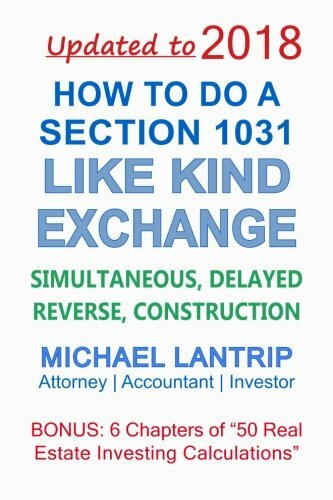 All of the top Real Estate Investors use Section 1031 instead of paying taxes on Capital Gains and Depreciation Recapture, and this is the Updated Authority on the Section 1031 Like Kind Exchange. You will learn how to: * Keep all of your profits, tax-deferred, * Use IRS money to buy more property, * Do owner financing within a Section 1031, * Buy & rehab without selling first, * 6x your personal property depreciation, * Close on an incomplete construction, * Do a partially-tax-deferred Exchange, * "Net" boot, debt, assumptions, and notes, * Access your equity tax-free (correctly! ), * Use Section 121 and Section 1031 together, * Make a vacation home an investment, * Report the Exchange on Form 8824, and * Refinance, die, and eliminate the deferred taxes. This is a clear over-the-shoulder look at the steps involved in a Simultaneous, Delayed, Reverse, and Construction Exchange, with real-life Examples, and detailed results explained with actual numbers. Supported with related articles that are available at S1031Exchange.com. If you have any questions about this product by Anderson Logan, LLC, contact us by completing and submitting the form below. If you are looking for a specif part number, please include it with your message.